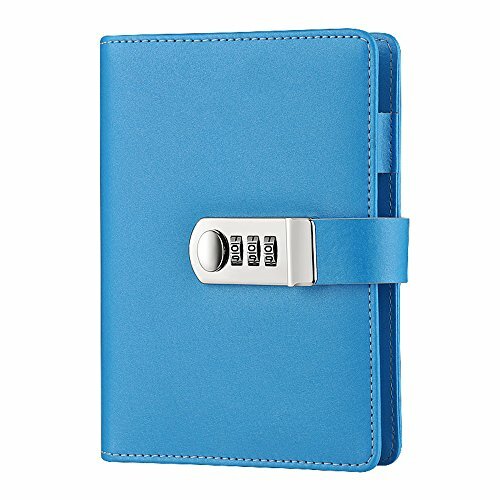 ToiM Macaroon Color PU Leather A6 Loose-leaf Locking Binder Journal With Combination Lock, Passcode Diary Secret Notebook (Sky Blue) by ToiM at LDP Graphic Design. MPN: TL067. Hurry! Limited time offer. Offer valid only while supplies last. Some Main Features of The Items: About the notebook: * INNER PAGES: 100g high quality recyclable ivory writing paper, horizontal line writing paper. * INNER PAGES: 100g high quality recyclable ivory writing paper, horizontal line writing paper. 100 sheets (200 pages). * IDEAL GIFT: A good gift for your friends or family. The password code lock closure is always popular. * GREAT FOR JOURNALING: Journaling is an ancient tradition that is carried on today. It is great to keep track of your daily thoughts and life events. * SUITABLE FOR TRAVEL: Keep track of all of your travel journeys and memories. Never forget a day from your travels. Write down all of your vacation or extended travel memories in this easy and convenient way. * MULTIPLE USES: Record your valuable thoughts, memories and experiences in this classic notebook. A must-have item for a diary, travel journal, poetry work, creative writing, listing ideas, making sketches & drawings. COVER: Made of high qulity PU, touched comfortably, sturdy hard cover protects your art for years. PRODUCT SIZE (A6): 13.5 * 18.5cm (5.31 * 7.28 in). INNER PAGES: Horizontal line writing paper, 100 sheets (200 pages). COLOR: Multiple colors are available. No matter you are a woman or a man, no matter which age group you are at, there must be one for you. PASSCODE: Creative metal password lock, 0-9 three-digit combination, hundreds of password combination, a good degree of confidentiality.